Curious about what went on behind the scenes of the March Madness Bracket Contest? Want to know how many votes did so-and-so win by? Well, here’s the rundown on the statistical data of the March Madness Bracket Contest! We wish we could take credit for being the first library to host a superhero-themed bracket contest, but that is not the case; do a search in Twitter, and you’ll see that plenty of libraries have done similar contests. But it was a first for us, so we took careful steps to make sure this contest was set up in the fairest way possible – which included the initial match-ups. Rankings for each hero were determined by a pre-vote held among the staff and student workers at the library. A list of as many heroes we could think of from both sides (by no means complete, but additions could be made) was passed around the staff, with each staff member voting for sixteen characters on each side (originally, it was going to be eight on each side, but based off of popularity, we extended it another week). The votes were then counted up, and ranking was decided based off of how many votes the characters received. See the picture on the right to see how the votes were tallied. Wolverine (#9) dethrones Black Panther (#8) by ONE vote, 28 votes to 27! The toughest match-up in this round, bar none! Two scientific brains colliding, but only one emerges on top: Iron Man (#4) flew circles around Ant-Man (#13), 43 votes to 12. The Guardians of the Galaxy (#5) dance-battles their way to victory against Dr. Strange (#12), 33 votes to 22. Must have been Baby Groot’s sweet moves that made the difference. Spider-Man (#2) just barely edges out the Fantastic Four (#15), 29 votes to 26. J. Jonah Jameson, eat your heart out. Deadpool (#10) out martial-arts Black Widow (#7), 42 to 13 votes. Someone deserves a chimichanga! Battle of the Captains: Captain America (#3) wins the round against Captain Marvel (#14), 43 votes to 12. By the Bifrost! Thor (#11) hammers his way to victory against the Hulk (#6), 32 votes to 23. Teen Titans (#1), Go! They have no problem crushing Blue Beetle (#16), 51 votes to 4. Supergirl (#8) swoops past The Watchmen (#9), 31 votes to 24. Close, but not close enough! Faster than a speeding bullet, Superman (#4) bypasses Black Canary (#13), 48 votes to 7. Not even her Sonic Scream can slow him down. Green Lantern (#5) possesses the willpower to defeat Catwoman (#12), 29 votes to 26! Turns out, being friends with Batman isn’t enough. Beware the bat! Batman (#2) batarangs his way past Martian Manhunter (#15), 46 votes to 9. Flash (#7) outruns Aquaman (#10), 43 votes to 12. Probably because he can run across water. Wonder Woman (#3) ropes Zatanna (#14) into submission, 49 votes to 6. No amount of spells can save you from Diana’s might! Holy Robin Hood impersonator! Green Arrow (#6) nails the bull’s eye against Batgirl (#11), 39 votes to 16. There is no “I” in “team” – nor is there one in The X-Men (#1) who defeat Wolverine (#9) in a landslide victory, 23 votes to 6. We had another one vote win, with Iron Man (#4) just barely squeezing past the Guardians of the Galaxy (#5), 15 votes to 14. Spider-Man (#2) beats Deadpool (#10), 18 votes to 11. Don’t be too upset, though: Deadpool is Spidey’s biggest fan. Asgard versus Midgard: Thor (#11) comes out on top, beating Captain America (#3), 17 votes to 12. In a surprising twist, Supergirl (#8) narrowly passes the Teen Titans (#1), 15 votes to 14. 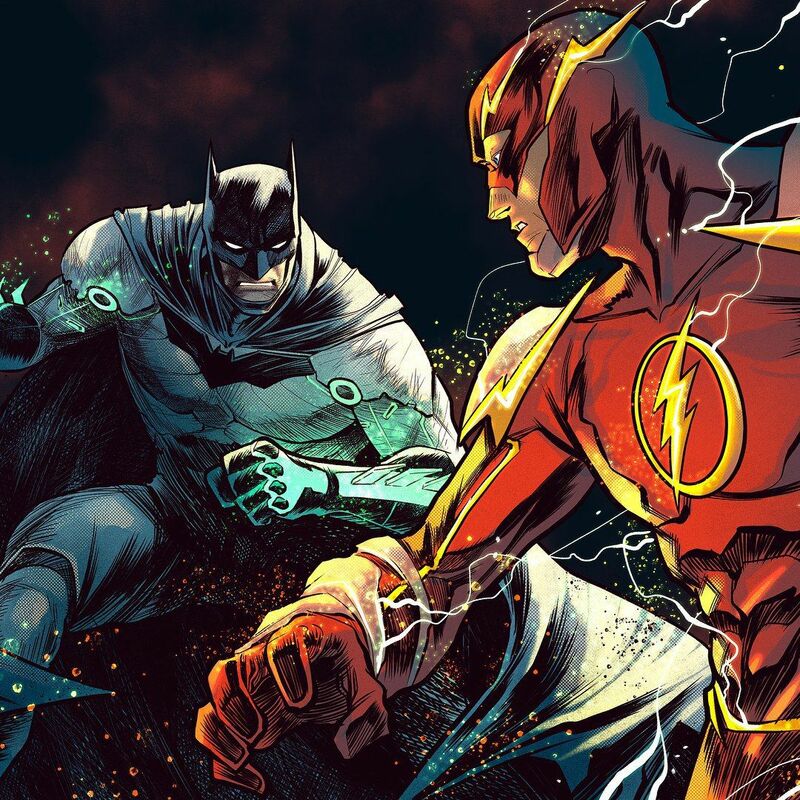 No Speed Force is going to surpass Batman (#2) who beats The Flash (#7), 20 votes to 9. There was no contest here: Wonder Woman (#3) destroys Green Arrow (#6), 26 votes to 3. He didn’t have a shot! Do you know what happens when a guy in an iron suit gets struck by lightning? The X-Men (#1) defeat Iron Man (#4), 19 votes to 13, that’s what! Positively shocking! Thor (#11) strikes out Spider-Man (#2), 22 votes to 10, yet another upset in the thunder god’s favor. In the battle of the cousins, Superman (#4) takes a lap around the world against Supergirl (#8), 19 votes to 13. Not even family could slow him down! It was a close match, but Thor (#11) manages to hold the X-Men (#1) at bay, 14 votes to 11. And they say lightning never strikes twice! Winner: WONDER WOMAN! In the end, Thor’s underdog streak comes to an end against Diana, who snags the win, 17 votes to 16. It was an impressive five weeks of battling from both sides, but DC Comics manages to outlast Marvel (if only the same could be said about their movie universes…) Thank you to all of you who voted – you made this first bracket venture of ours a success! Stay tuned next year for 2019’s March Madness Bracket Contest, as well as all things happening at the library until then! ← Happy National Library Week!